Here it is, the write up about the actual landmark site; took three attempts to find it, but exploring is half the fun of being an adventurer. Roy couldn't be on this part of the adventure with me, so my dog Jenna volunteered to keep an eye on me. I need to give a bit of background history on the site; it will tie in with the chocolate exhibit at the Natural History Museum in Salt Lake City. The pottery that cacao was found in came from this landmark site; it proves these ancestral people used it before the Aztec in Mexico. So, in the summer of 1908, Byron L. Cummings (University of Utah) continued his archaeological work in the Southeastern Utah region by focusing on upper Montezuma Canyon, including a small excavation at Alkali Ridge. Along on this expedition was Alfred V. Kidder who became a leader in the field of archeology. However, it wasn't until John Otis Brew of the Peabody Museum of Archaeology and Ethnology; a museum affiliated with Harvard University in Cambridge, Massachusetts, that Alkali Ridge was fully explored. Three separate expeditions (1931, 32, 33) exposed the massive settlements that existed in this area covering Basketmaker III (c. 500CE - c. 750CE) to Pueblo II period (c. 900 CE – c. 1100 CE). The site revealed hundreds of pit dwellings, multi-storied structures, a central courtyard, kivas, irrigation for agriculture and high quality ceramics. After documenting and photographing the site, the ruins were covered over; all that can be seen now are piles of rubble, stones sticking out of the ground which denote the outline of structures, pottery shards and simple tools made from agate for cutting and scraping. A prized possession, if you can find a copy, is "Archaeology of Alkali Ridge, Southeastern Utah" by John Otis Brew (published 1946) which is basically the only proof of existence of the ruins from the photographs and drawings. How to find this landmark: From the Monticello Welcome Center on Route 191, travel south for 11.3 miles; turn onto Mustang Road (CR 207) just before mile marker 60. 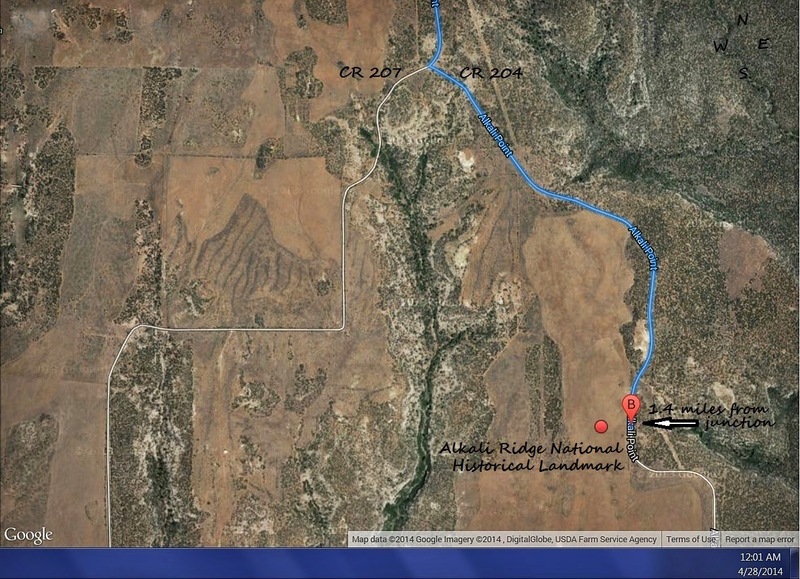 Stay on CR 207 for 2.8 miles to the junction of CR 207 and CR 204 (Alkali Point Road); turn left onto CR 204 and the entrance is 1.4 miles on the westward side. Now for an odd story, walking around the Ridge, a slight breeze blowing, clear sky and being able to see to the edges of the earth, or so it seemed; the Ridge is a serene place to visit. On our way back to the SUV, Jenna exhibited a sudden odd behavior; she sat down against my legs and refused to let me continue walking forward, but her head was turned to allow her to look behind me at the area we had just left. This went on for a good 10 minutes; every time I tried to move forward, she would purposely press herself against my legs and not allow me to walk; she kept looking back at the central dig site though. Suddenly, she got up and walked back to the SUV with me to follow; I looked back, but saw no person or creature; then again, that doesn't mean that no one was there. I did say it was a serene place to visit and who knows what people still reside there, even if just in spirit.